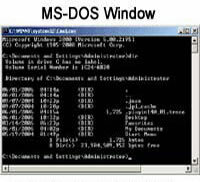 Similar to the PATH MS-DOS command, the append command enables a user to open files in the specified directory as if they were in the current directory. Tip: See our append definition if you're looking for information about how to append text or a file into a file. Append.exe is an external command available in the below versions of Microsoft operating systems. Drive: The drive letter to be searched. \Path The path to be searched. /E Causes the appended path to be stored in the DOS environment and searched for there. ; Use ";" to separate multiple Drive:\path statements on one line. Note: You can not use any paths on the same command line as /X and /E. The :ON and :OFF options are only available in MS-DOS 5.0 and later. Do not append within a Windows environment. The append command can be used on a network. Invalid drive specifications will not be detected until DOS attempts to use the search path to find specified files. Using append alone will display the current search path. Sets the computer to look for files in the docs, letters and files directory, therefore when typing a command such as "edit myfile.txt" if the file is not present in the current directory the computer would also look for the file in docs, letters and files directory.